With the growth in both High Speed and Light Rail infrastructure projects worldwide there is a general requirement for accurate modelling of the interaction of the track with respect to any supporting bridge structures, and in particular, to ensure that any interaction between the track and the bridge as a result of temperature and train loading is within specified design limits. When used in conjunction with the Nonlinear option, the LUSAS Rail Track Analysis option permits track/structure interaction analysis to the International Union of Railways Code UIC 774-3 and to the relevant sections in Eurocode 1. It automatically builds models from data defined in Excel spreadsheets and quickly produces results in spreadsheet or LUSAS results file formats. To accurately assess track-structure interaction effects nonlinear analyses are required to investigate thermal loading on the bridge deck, thermal loading on the rail if any rail expansion devices are fitted, and vertical and longitudinal braking and/or acceleration loads associated with the trainsets. This can be done for both ballasted or ballast-free tracks. 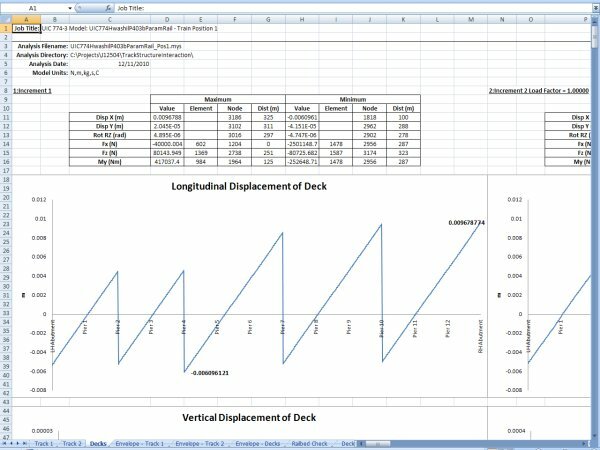 Track and bridge interaction models are built automatically in LUSAS from geometric, material property, and loading data defined in a MS Excel spreadsheet. Both thermal loading to the track and train loading due to acceleration and braking forces can defined. 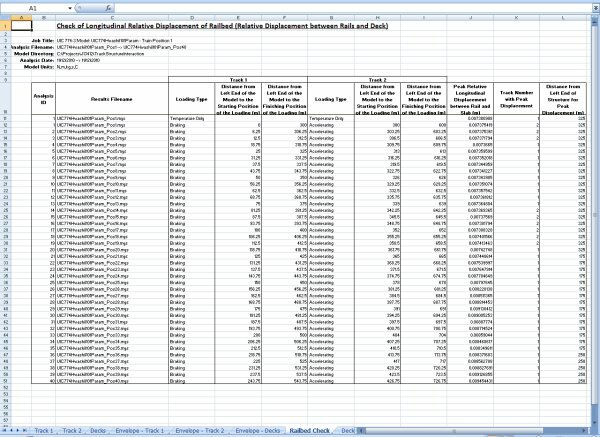 Multiple trainset positions can be defined in a single MS Excel spreadsheet. In accordance with the UIC774-3 code of practice, a user-specified element length is used to define the longitudinal embankment and bridge features. Rail clips, ballast movement, bearings and pier stiffnesses are all included in the analysis model. The model building dialogs allow for either one train crossing one or more structures, or for multiple trains crossing the same structure. A key feature of the LUSAS Rail Track Analysis option is that it automatically updates the material properties associated with the track/structure interface based upon the position of the train or trains crossing the bridge. 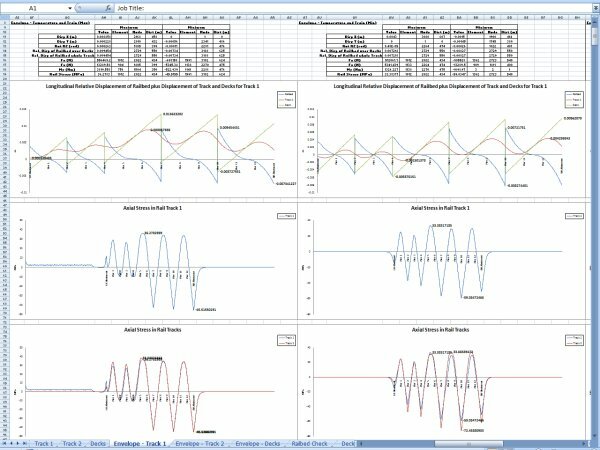 When running an analysis, deck temperature loading can be considered in isolation for subsequent analysis of multiple rail configurations, or a full analysis can be carried out considering the combined temperature in the deck and rail loading. Because the response of the ballast and/or track restraining clips is nonlinear a nonlinear analysis always needs to be carried out. For a complete rail track assessment, dynamic effects caused by the passage of trains that affect the structure itself should also be considered. Results can be produced in either Excel spreadsheet or standard LUSAS results file format. Enveloping of results is carried out by either choosing to do so automatically inside Excel or by specifying user-defined load combinations inside LUSAS. Tables of rail stress values. 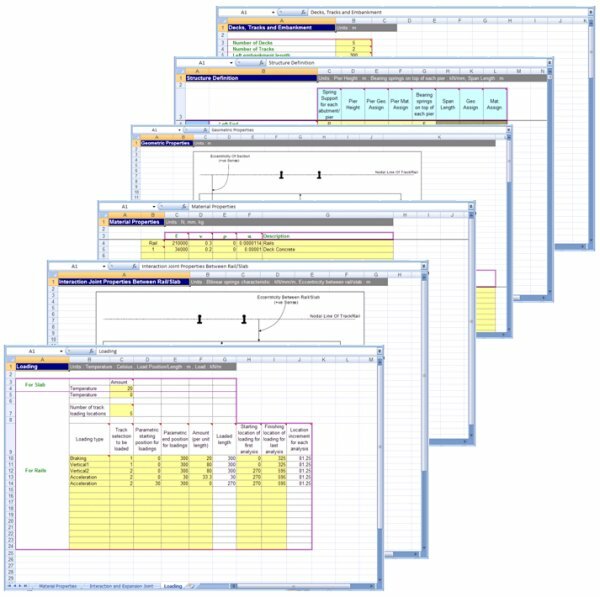 The three latter tables provide key results in summary form and allow the quick determination of which analysis is causing the worst effects for each of the checks that need to be carried out to the UIC774-3 code. Some example results worksheets follow. Using LUSAS a variety of similar graphs, tabular listings and results plots can be obtained to permit checking of most key values against UIC774-3 code, but the creation and viewing of results in the Excel spreadsheet is superior in that it provides automatic enveloping, summaries and graphing of the key results for each loadcase. Typical axial force results plot from LUSAS showing force in continually welded rails from temperature loading to the deck. 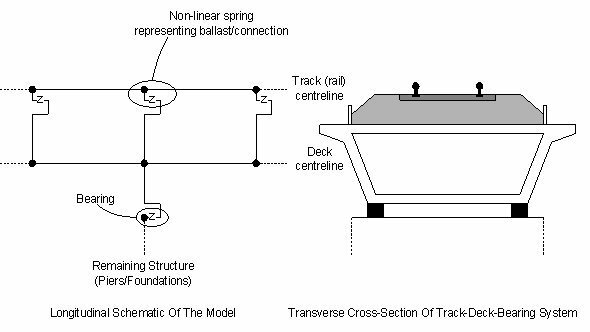 For multi-span and multi-deck structures such as that shown above the interaction between the embankments / abutments and other decks means that the behaviour can be complex. As an example, when considering only thermal loading on a structure having continually welded track it is common to see a reversal of the axial force / stress in the rails. Whilst not apparent from the size of the model shown, the structure illustrated above is 325m long and consists of two decks, each with two 25 m spans followed by three decks, each with three 25 m spans. One pier / bearing support for each deck is represented by a restraining spring which takes account of the deflection characteristics of the pier / bearing system in accordance with UIC774-3. All of the remaining piers / bearing supports are roller supports allowing longitudinal movement of the decks. Under the effect of temperature on the structure the axial force / stress in either of the tracks / rails can be seen to vary. This is primarily due to the interaction between the movable and fixed structural components. Because of the nature of the analysis the use of the Rail Track Analysis option requires the following options to be accessible.